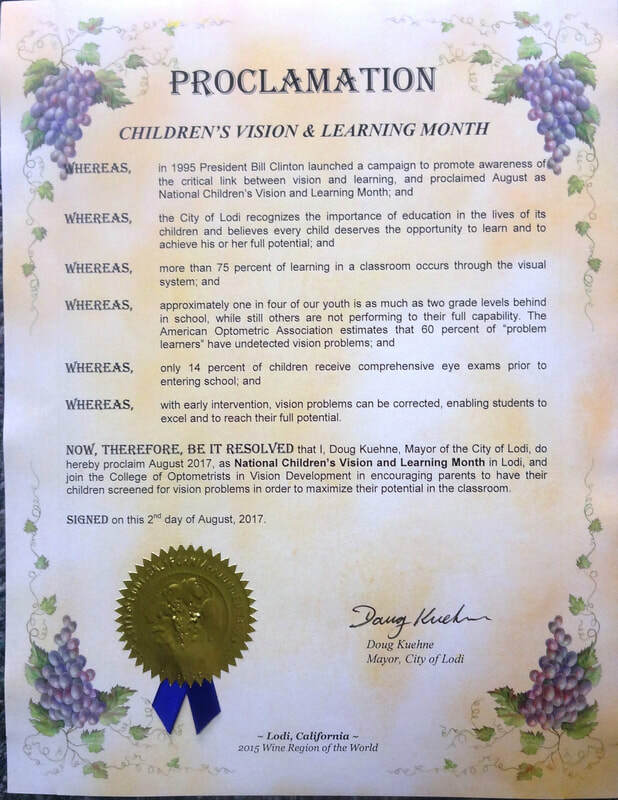 Mayor Doug Kuehne proclaimed August to be Children’s Vision and Learning Month in the City of Lodi during the August 2, 2017 City Council Meeting. Dr. Bill Henshaw, a Lodi optometrist who treats visually related learning problems, was presented the written proclamation. This is the 22nd year of The National Children’s Vision and Learning Month originating with Dr. Henshaw’s specialty group The College of Optometrists in Vision Development. The College is a certification, educational, and advocacy organization of optometrists who specialize in vision therapy. Dr. Henshaw is a charter member of the College. Dr. Henshaw thanked the council for a step in assuring kid’s vision care will not be ignored in their return to school. He discussed that in addition to kids struggling in school, the A student who over works is often ignored. He then demonstrated a simple vision screening for the council members and attendees by simply looking at their thumb and alternately closing each eye. A perceived movement of the thumb indicated a vision problem. Although the emphasis of vision and learning in August when Lodi kids start school is a great idea, in Dr. Henshaw’s office every month is vision and learning month. Simply call the office for an appointment at 334-2020. What Would Jesus See? now in print !!!! My book is published! The Book is What Would Jesus See - a Developmental Optometrist’s Journey Through Vision Care with an Eye on the Bible. It is $12.00 on Amazon and my office. It started in 1985 when as a new born-again Christian I noted the pastor seemed to discuss vision in his sermons. I looked in the concordance, wrote many note cards, and gave a paper at the San Jose Vision Training Seminar in August. I kept adding and writing the paper for the general public. Now the pages and years have grown! Previously a pastor shared Heb 12:2-3 that says, “Let us fix our eyes on Jesus, the author and perfecter of our faith ... so that you will not grow weary and lose heart.” You will not grow weary If you fix your eyes on Jesus, who created and sustains you. It reminded me of job burn out. If you rely on your conscious system, you work very hard and are exhausted. That can lead to a tendency for eyes to wander outward, the opposite of crossed eyes. It is often connected with job burn out. Some call this a wandering eye. Concentration requires eye alignment on the object you look at. That could be a welding bead for a welder, a spread sheet for an accountant, or even the thought of a building design for an architect. Through vision therapy Mr. Gonzales, prolonged his welding career another five years to support his granddaughter through college. He also loved his job; and although well over the age of retirement, he wished to remain on his job. His job was in jeopardy as he now had trouble making his welds straight because of persistent double vision. Previously he willfully forced his eyes to look at the bead. He now grew weary and could not sustain that effort. Through vision therapy he learned to use his eyes the way Jesus created them to effortlessly look at any object - the welding bead. Not only did he retain his job, he was now able to perform it effortlessly and prolonged his career. Through vision therapy Mr. Gonzales was able to use his eyes the way Jesus created them as well as sustain performance because Jesus sustains all things. Mr. Gonzales regained his heart as he could continue his loved welding job and provide for his granddaughter. Ricky Henderson is a retired high caliber baseball player. Many do not know he has a wandering eye. Could he have prolonged his baseball career had his eye turn been treated? Could he have enjoyed his time playing if treated in the beginning of his career and not lost his temper so much? Could you enjoy your career, family, and life more? Who knows when education will adopt proper methods? Our current President is pushing for reading at even younger ages. In the meantime there is a solution: enhance our young kids vision system with simple home activities as well as use special glasses for reading and computer activities to protect their eyes. The activities are based on the work of a developmental optometrist aware of George Spache’s research and the proper application of Jean Piaget’s work. Our office outlined Dr. Gerry Getman’s book How to Develop Your Child’s Intelligence written in the 60's and since revised into step by step principles with recording sheets to watch your child’s progress. We make the program available to all families with young children, and all the kids in can benefit from one program. Our treatment of Light Therapy is but an example of one of God's characteristic - that of Light. What does knowing God is light have to do with optometry? Actually a lot! One of our treatments is light therapy. A specialized instrument shines light of a particular color into patients’ eyes to improve their vision system. I picture light emanating from Jesus shining into their eyes. I think you would agree that is a direct application of light( Jesus ) into practical daily life. Light therapy has many uses. One is to treat side vision losses and headaches. The most common cause of those problems are automobile accidents resulting in either whiplash or head trauma. Ida, now eight fell and hit her head on the pavement at two. Among other vision conditions it caused enlarged blind spots and reduced side vision as well as headaches. After ten 22 minute sessions of viewing colored lights her headaches were gone and her side vision and blind spots returned to normal. You can see the changes to her vision field in her left eye. I consider this a demonstration of God’s power in our daily lives. Not only does Jesus bring spiritual healing, He also brings physical healing. I feel privileged to be a vessel in that process. We love our Jimmy Crystal line from A & A Optical. Not only are the frames gorgeous and full of bling, they have accompanying i-Phone covers, pens, and rings. Judy just loves her Jimmy Crystals!